Robert Zemeckis's 80s blockbuster, considered against its historical and cinematic contexts, its treatment of time travel and teen culture. Back to the Future was the top-grossing film of 1985 and the eighth highest grossing film of the 1980s. It was nominated for an Oscar and a Golden Globe for Best Original Screenplay in 1986, and won the 1986 People's Choice Award for Favourite Motion Picture. Co-written and directed by Spielberg protege Robert Zemeckis, it became a landmark of 'New New Hollywood' and has continued to grow in popularity, voted 20th in Empire magazine's 2006 readers' poll of the best films of all time. In 2007, the United States Library of Congress deemed Back to the Future to be 'culturally, historically or aesthetically' significant enough to be 'preserved for all time' in the National Film Registry. Other choices that year included such classics as The Man Who Shot Liberty Valance (1962), Now, Voyager (1942), Oklahoma! (1955) and 12 Angry Men (1957). Andrew Shail and Robin Stoate's study of the film places it in the historical context of Reaganite America and the cinematic context of the 'New New Hollywood' and Zemeckis's filmmaking career. They discuss the film's treatment of time travel and its depiction of the potential and pitfalls of science and of atomic energy. 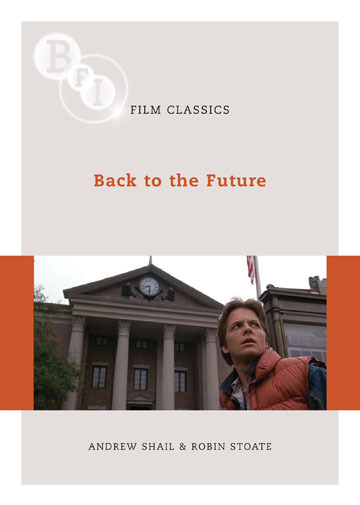 Shail and Stoate consider Back to the Future's attitudes towards teen culture of the 1980s and the 1950s, seen in the film as a period in which traditional 'American' values and gender roles held sway to the benefit of family and community life, in contrast to the more troubled decade from which Marty McFly begins his time-travelling adventures.